It’s a wrap….my birthday is almost over. Today, I woke up to a very sick kid. My 18 year old, Scott, came in my room around 8am to inform me he was feeling terrible. He had severe sharp pains in the top of his left lung, a really high fever and chills so bad his teeth were chattering. He really scared me because the pain was so bad it brought him to tears, and that doesn’t happen often with 18 year old guys. I gave him 3 motrin and a vicodan to take the edge off the pain and help him relax. I called the Dr. and got him in at 5pm tonight. Dr’s diagnosis? The kid has pneumonia. That doesn’t surprise me, considering the fever and chest pain and difficulty he had breathing. He’s on antibiotics now and should be fine. I ran out in between time this morning to Lane Bryant to cash in my Real Women Dollars. I picked up some goodies for myself for my birthday. When I got home, I was greeted by a big beautiful bouquet of colorful flowers on the kitchen table. They were from my out of town husband and the card read, “Love you. Miss you. Be home soon! Happy Birthday, love Larry. What a pleasant surprise. They are so pretty and were such a surprise! Thank you Larry, I love them! My kids had tidied up the house while I was gone and Scott’s girlfriend had a batch of cupcakes going in the oven. What a sweet girl, she’s knows just what I love–cupcakes! And so ends another birthday. It was definately different! Oh by the way, remember the Emily-ISM about having something special to do and coming down sick? Scott had that exact problem today. He was scheduled to go to a concert tonight in downtown Chicago. He’s had the tickets for 4 months now. He was so sick, he decided to sell them to a friend for a 1/3 of what he paid for them. Go figure. Life does throw us a curve ball now and then. At least we have cupcakes to console us. Next postWhat constitutes your personal style? Being a good Mom…it just never ends, does it? My “baby” is almost 24 and when she’s sick, no one can take care of her like her Mommy 😉 Hope Scott gets better real soon. 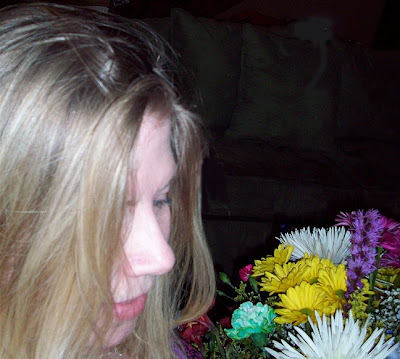 Happy Happy Birthday Em…the flowers are so pretty! Wishing you a wonderful year..
I’m happy to see that Larry rememberd you and sent you such a lovely bouquet. I feel for Scott and hope he’s up and feeling better in a couple of days. I’ve had pneumonia twice now and it takes much longer to recover from. He still has to take it easy for a couple of months once he’s better so he doesn’t come down with it again. My hugs and love to that boy. I’ll admit it…He’s my favorite! LOL! Happy late Bday!! Hope the cupcakes were good! Hope Scott’s better soon!! Happy birthday Em…your flowers are gorgeous…and i hope you enjoyed your cupcakes..
Hope Scott is feeling a little better…poor baby!! I have heard many say that as we get older birthday’s don’t mean as much. But I totally disagree. I think we must treasure and celebate them more. I know you must have been very worried about your son, so happy to hear he is doing better.